All veterans are invited to attend a special ceremony to remember the anniversary of the attack on Pearl Harbor, presented by the Camden and Gloucester County Freeholders, at 10:00am on Friday, Dec. 7. 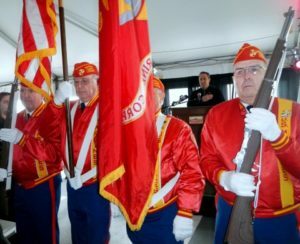 The ceremony, which will take place on the fantail (tented rear deck) of the Battleship, will feature keynote remarks, musical performances, a 21 Gun Salute by Marine Corps League 1775 Detachment, salutes to veterans and a wreath presentation to remember those killed in the Pearl Harbor attack. The event is free to attend and there will also be complimentary coffee and hot chocolate, courtesy of the Camden County Canteen. Free parking is available at lot #1, across from the BB&T Pavilion, courtesy of the Camden Parking Authority. Free shuttle service from Lot #1 to the Battleship will be provided by South Jersey Transportation Authority.